After six straight months of factory orders unexpectedly declining, economists apparently were finally convinced that bad weather would continue indefinitely. Factory orders rose, albeit barely, and last month was revised way lower, nonetheless it was amusing to see economists expectations were in the wrong direction for the seventh straight month. This month, factory orders unexpectedly rose. The Bloomberg Consensus estimate was for no growth, while orders rose a modest 0.2%. After 6 straight declines, factory orders finally moved to the plus column, up 0.2 percent in a February gain, however, that is tied largely to an upward price swing for petroleum and coal products. 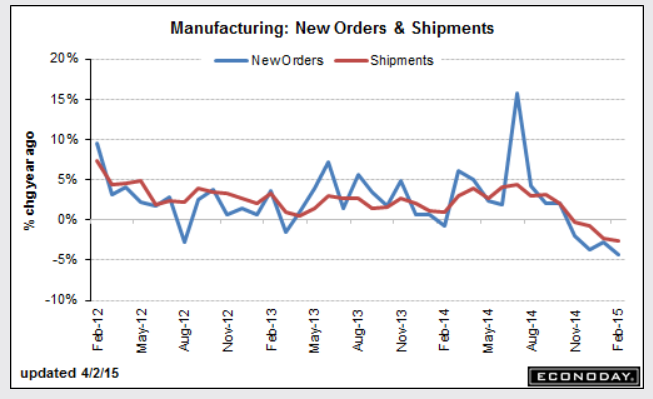 Another mitigating factor is a sharp downward revision to January orders, to minus 0.7 percent from minus 0.2 percent. Durable goods show broad weakness with orders down 1.4 percent in data initially posted last week. Most readings show significant declines and underscore this morning's export dip in the international trade report and the Fed's concerns over weak export markets and the negative effects of the strong dollar. Core capital goods are down 1.1 percent in the month for a 6th straight decline in a reading that points to a lack of business confidence and business investment. Total shipments bounced back 0.7 percent in February but follow a 2.3 percent plunge in January and which holds down factory contribution to first-quarter GDP. A clear negative is a 3rd straight decline for unfilled orders, down 0.5 percent for what is now the weakest string since way back in the recession days of late 2009. A lack of unfilled orders will not encourage manufacturers to add to their workforces. One positive is inventories which are less heavy, up only 0.1 percent and bringing down the inventory-to-shipments ratio to 1.35 from January's recovery high of 1.36. The main positive in today's report is the non-durables component where a 1.8 percent gain ends 7 straight declines, declines all tied to oil-price effects. But the weakness in durables, tied to foreign demand, is becoming a significant negative for the economic outlook. The string of declines ended. Hooray! Otherwise, this looks like another bad month.